3D printing is the process of building three-dimensional objects based on a computer-assisted design. The single digital model is then separated into multiple tiny layers using a software known as a “slicer.” Our Dremel 3D printers melt a plastic filament at a very high temperature, momentarily liquifying it. Like a smart hot glue gun, the printer uses the file of the model to know where it needs to be at any given time, building the object up layer by layer. 3D printers are being used in a variety of jobs, including the medical field, manufacturing, and architecture. Learn how to use our 3D printer with training sessions. Sign up now to earn the 3D Printing badge. 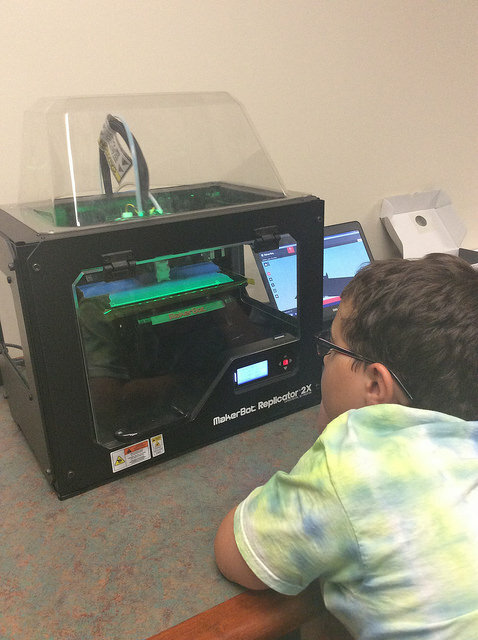 Earning the 3D Printer badge allows you to reserve the 3D printer to build your own projects in the MakerLab. You must earn the 3D Printer badge before applying for the 3D Scanner badge. In exchange for use of the machine in the lab, you also agree to also share information about your project with curious customers.